The 19-year-old could be set for a spell on the sidelines due to a foot injury picked up at Wembley last night. 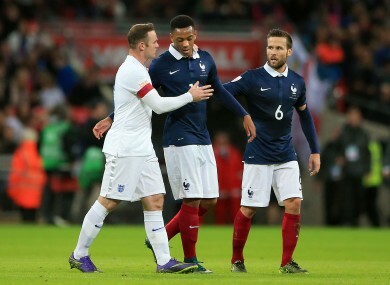 Martial and club mate Wayne Rooney alongside Crystal Palace midfielder Yohan Cabaye at Wembley last night. MANCHESTER UNITED FACE a nervous wait to discover the extent of an injury suffered by Anthony Martial during France’s 2-0 friendly loss to England last night. Martial started the match at Wembley Stadium and impressed before being withdrawn, apparently unhurt, in the 67th minute, with Antoine Griezmann coming on in his place. However, the 19-year-old was later pictured on crutches with his left foot in a bandage. Speaking after the match, France coach Didier Deschamps revealed Martial received “a knock to the top of his foot” and was “in quite a bit of pain”. It remains to be seen if the livewire attacker has suffered mere bruising or a more serious problem. Signed by United from Monaco in September for an initial fee reported to be £36million (€51m), the young forward has outshone higher profile attacking team-mates Wayne Rooney and Memphis Depay so far in 2015-16. United manager Louis van Gaal and Deschamps will both be keen to learn more about the health of a player who is quickly becoming a key man for club and country. United are away to Watford in the Premier League on Saturday, while France have qualified automatically for the European Championship finals next year as hosts. Louis van Gaal: I don’t do anything anymore and earn a lot of money! Email “Man United may have to plan without Martial as French striker spotted on crutches ”. Feedback on “Man United may have to plan without Martial as French striker spotted on crutches ”.